Courtney Shackelford is the Admissions Associate for Southwestern College, as well as a MA Art Therapy and Counseling student. She earned her BFA in Communication Arts from Virginia Commonwealth University, with a specialization in illustration and comics. Courtney began in the helping field as a volunteer at a local hospice in Fredericksburg, Virginia and was finally able to combine her passions for helping others with her passion for art. She worked with geriatric patients both in and out of memory care, as well as with grieving children as part of the bereavement support offered through the organization. 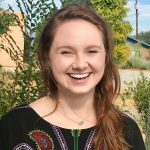 She hopes to continue her education and professional trajectory specializing in bereavement work with children at Southwestern College and at the Tierra Nueva Counseling Center in her practicum. If you are interested in the school, Courtney would be more than happy to speak with you about the admissions process. She offers a unique perspective as both student and staff. Courtney is a Virginia transplant, so she is excited to recommend new places to visit as she learns about them and assist with any relocation concerns. She also recommends the green chile here. She may be contacted by email at courtneyshackelford@swc.edu or by phone at 505-467-6591 for further questions.